A little bike inspired by the BSA Otter Super Cub and SQ pages what a Super Little Bike. 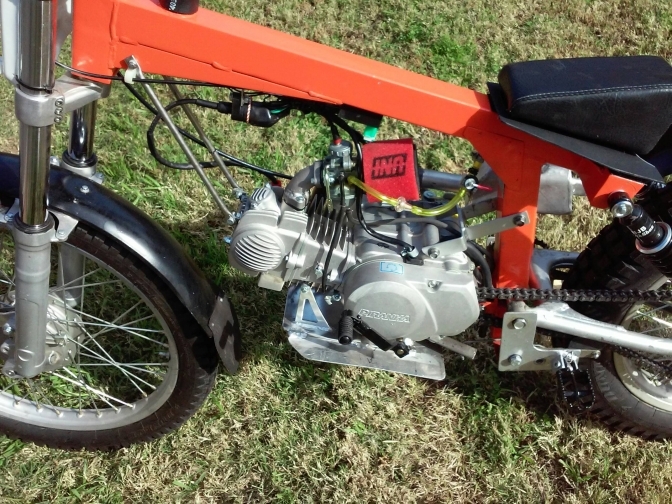 Bill Todd has built this Super-Cub Based little machine with the help of these Pages and Web site he says. Yet another Machine that we have encouraged! And thank you Bill Todd for sending us this Story. Photo Courtesy Bill Todd and Copyright. Special" or "Orange Is The New Black"
I Used 2 inch square tubing for the frame the angle is about 68 degrees. 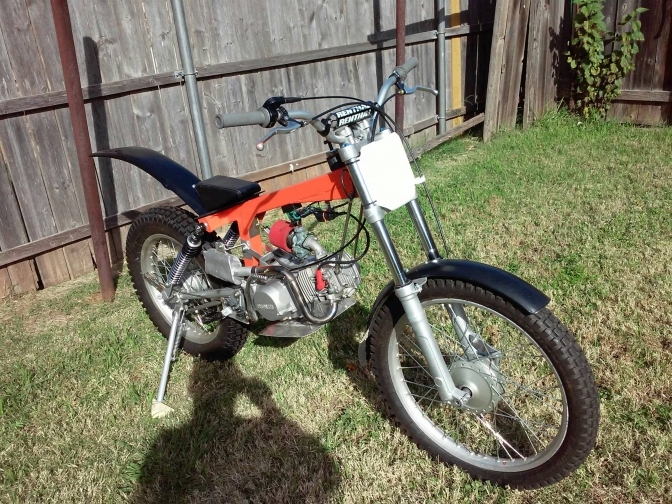 It has a 38mm Sherco fork and a TY 175 front brake. 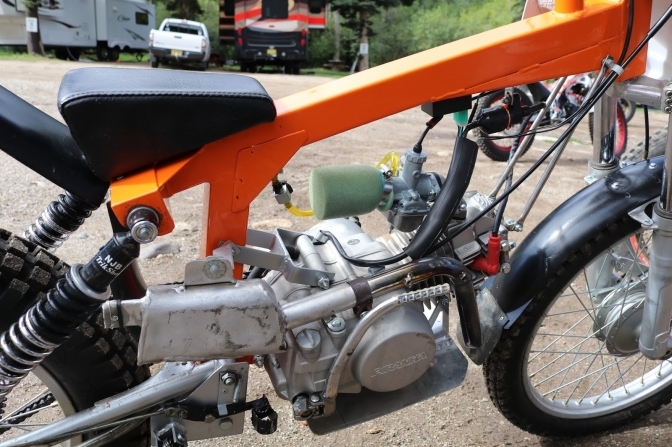 arm and hub is a Honda XL 125.
started at about 8,000 feet and went up the mountain. 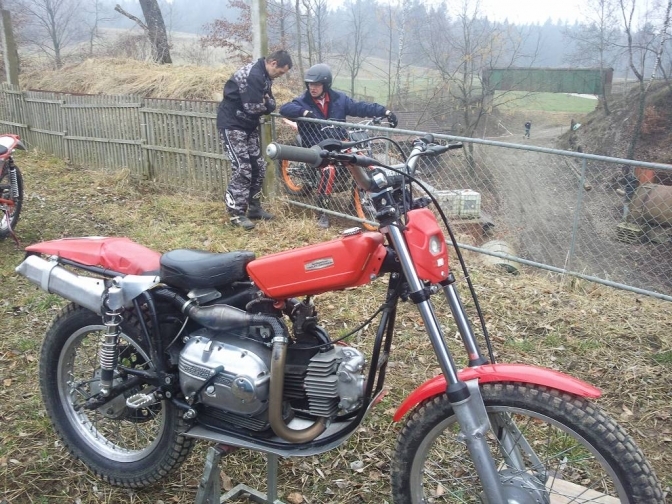 the bike, not the engine, finished both days. More Later Just a Start. 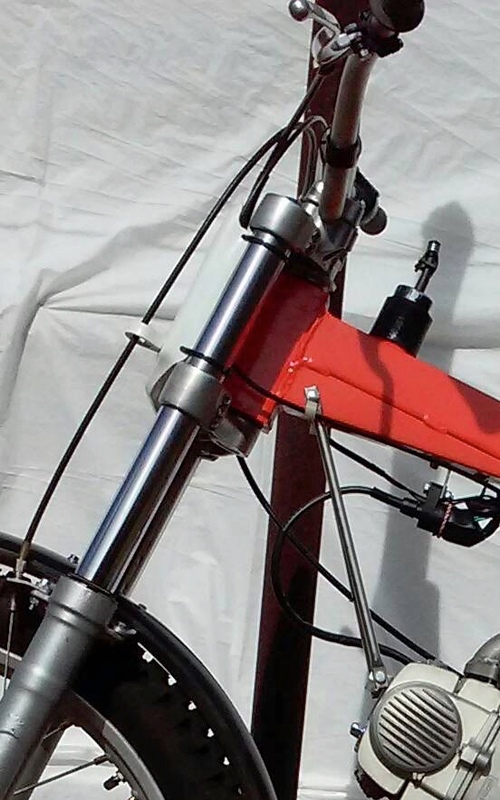 Details of the bike build. 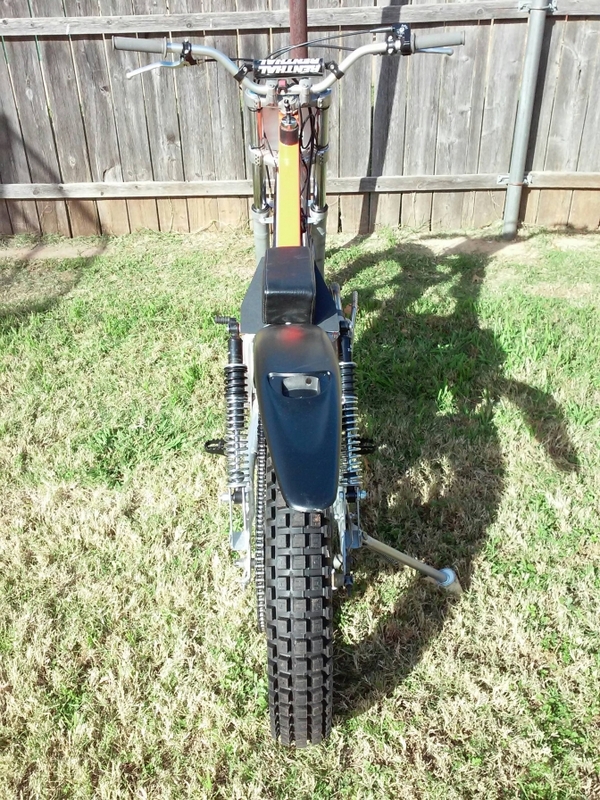 The top tube holds about 1liter the fuel, cap is a Harley oil tank bung. It is about two inches longer behind the seat tube for the shock mount. The seat tube is about 1inch shorter than the (DIY page) measurements. 22.5 degrees, cut the rest with a band saw. I Clamped the tubing on a flat plate for Mig welding. USA vintage section very little straight streams and water! 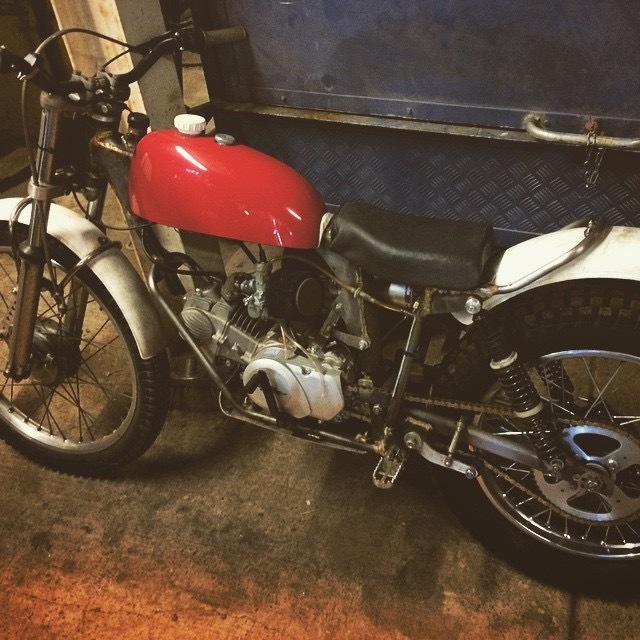 Charlie> Thanks Bill There is loads of interest in the little bike. How Neat is that ! 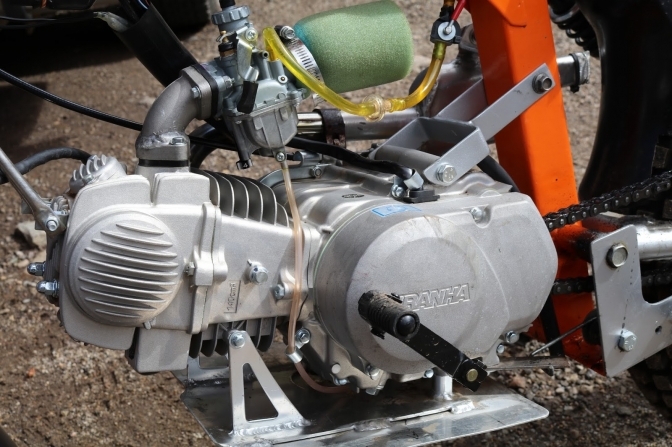 Frame built for the engine , or is it the engine built for the frame? 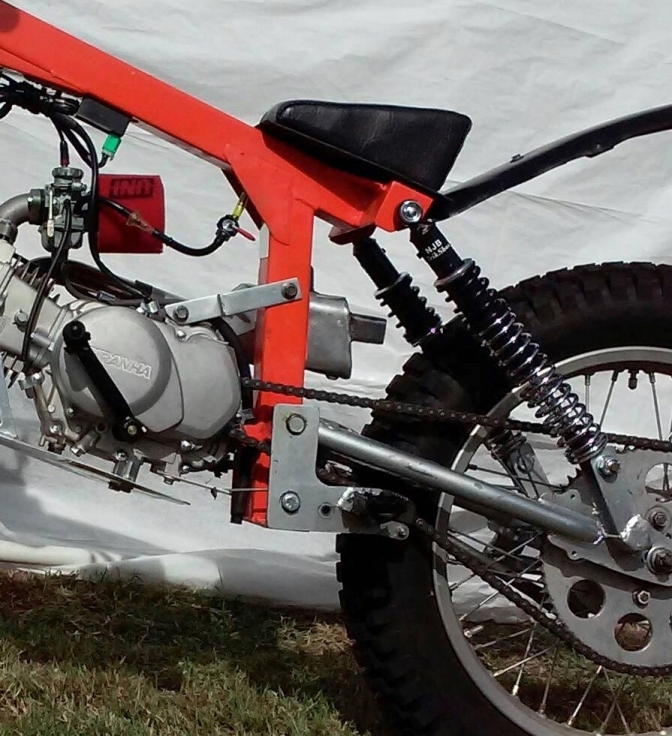 An Old WES silencer was used, again looks the part. With a square section steering head you still need a Round bearing carrier to take the taper bearings. One method is to just turn two bearing carrying cups with a spigot that fits tightly inside the square head tube and then just bronze weld the joint around top and bottom. Or do the same thing and use 2" round tube and mitre it in the same as I did on my SQ frame. Now with NJB "Trick-Shocks" you have the "Rose joint" fixings, so the shocks do not have to run in a vertical plain to work and can lean into a reduced top measurement. 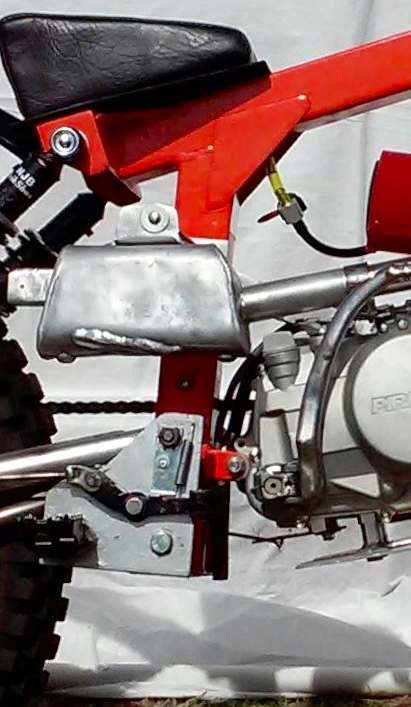 Now just look at the simplicity of that top suspension mount, just folded angle plate and enclosures. 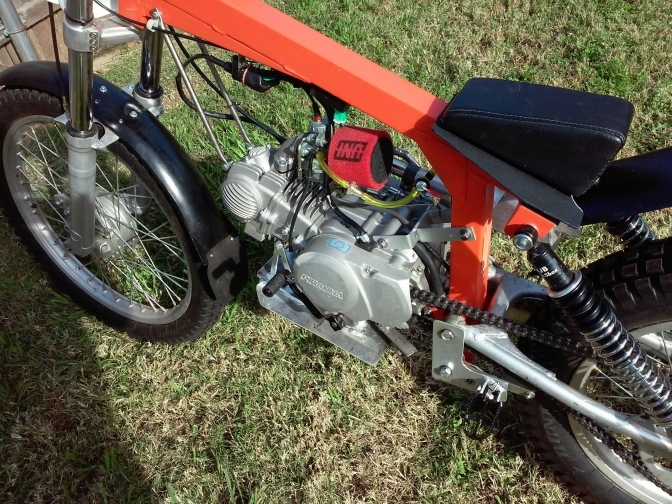 Engine mount like my "Super Cub", and a Honda 125 XL swing-arm and rear wheel that fits the concept perfectly. Jon and I used these arms on the "Mini Majesty" builds with the Chinese motors. The simplicity just stands out by miles. 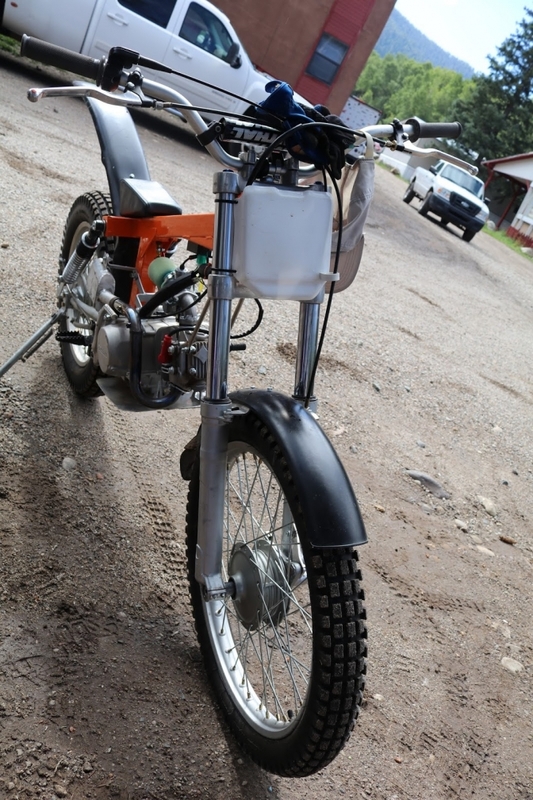 The 38 mm forks do not overpower the little bike. 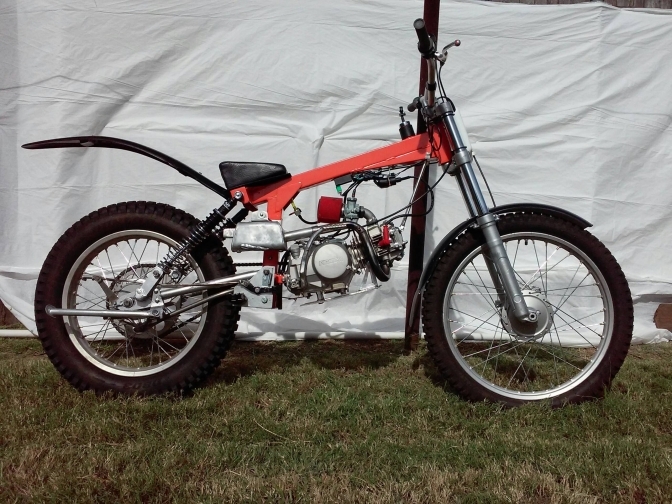 and you know I would not use any other front brake than the TY Yamaha, now on any of my builds. 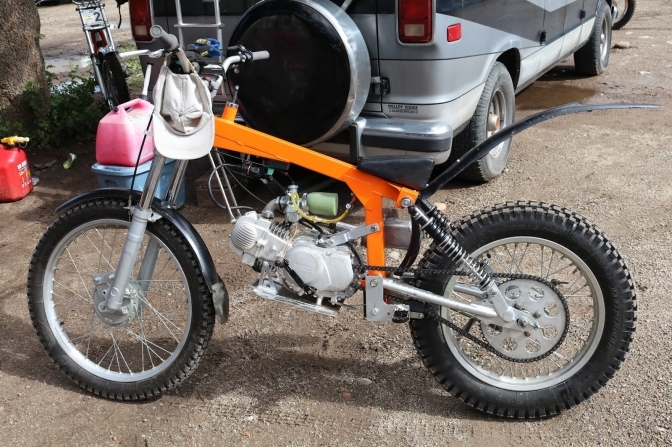 This type of little bike has got to have a future. By the way all photos © Bill Todd. reserved by "Otterman". You know it makes sense, What a FUN little bike. Even a comfy little seat. That Just Is is a pretty little bike. Just the thing to start a trials riding career. 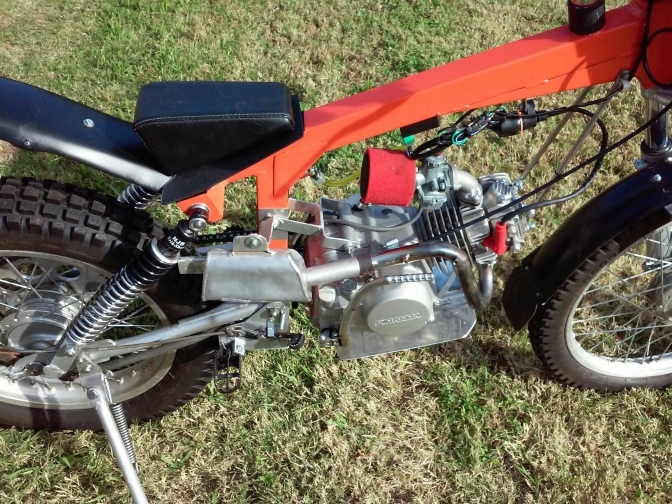 For those of you that may be contemplating building one of these little machines for yourself . Here is a bit better detail of the engine mounting method, and also the footrests 6mm thick mild steel plate is about right for the footrest hangers. Also you can see that Bill has fitted the tap in front of the seat tube for a better and tidier fuel line run. You can see here the main bottom engine mounting, just bent steel strip and then welded the the face of the seat tube pillar. 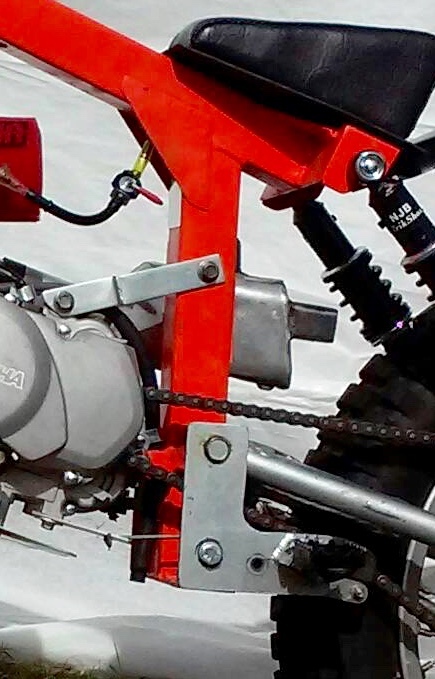 And the snazzy little rear brake pedal, simple but I hope there is enough leverage for the brake to work well. But with the weight of this machine there is not that much to stop is there. Look you have Most of the detail to build one yourself.. 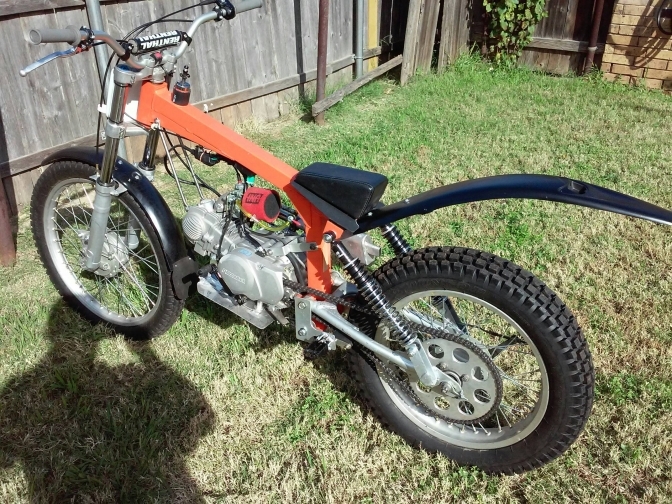 The two photos below show the first and second "Super Cub" built by Jon Bliss as examples to "the concept," of a cheap lightweight trials machine. And again this one built by Jon Bliss, for comparison. 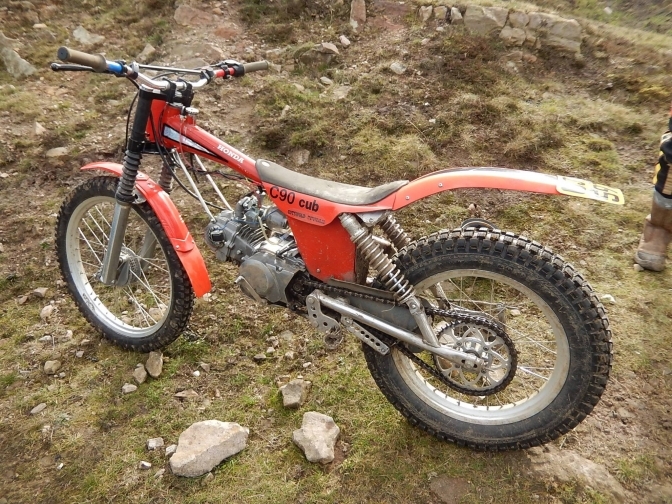 Jon's swinging arms are to the same dimensions as the Honda XL unit used by Bill. 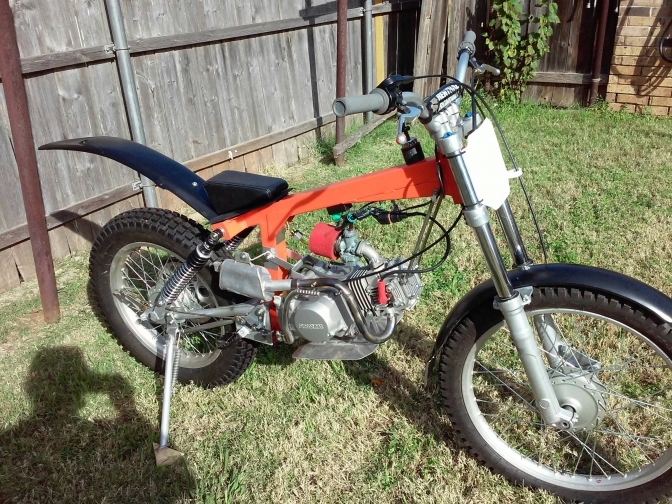 I have a Honda unit to use on my version. And again a Jialing rear wheel that is the same as the Honda XL wheel. 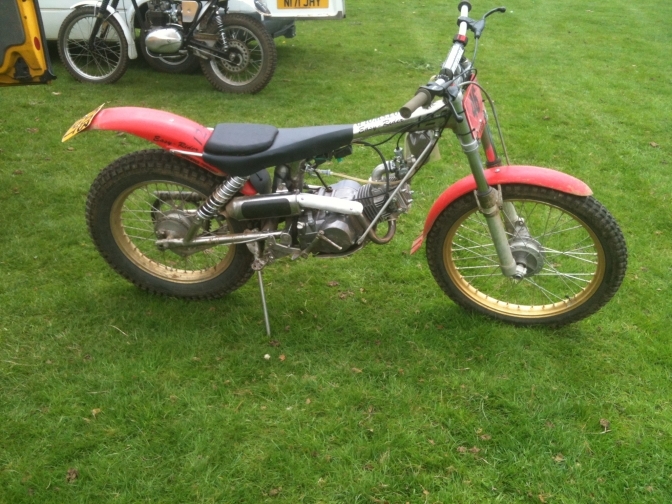 Jon has used pit bike brakes on his bikes which are the same size as the Yamaha TY brakes and just as good. 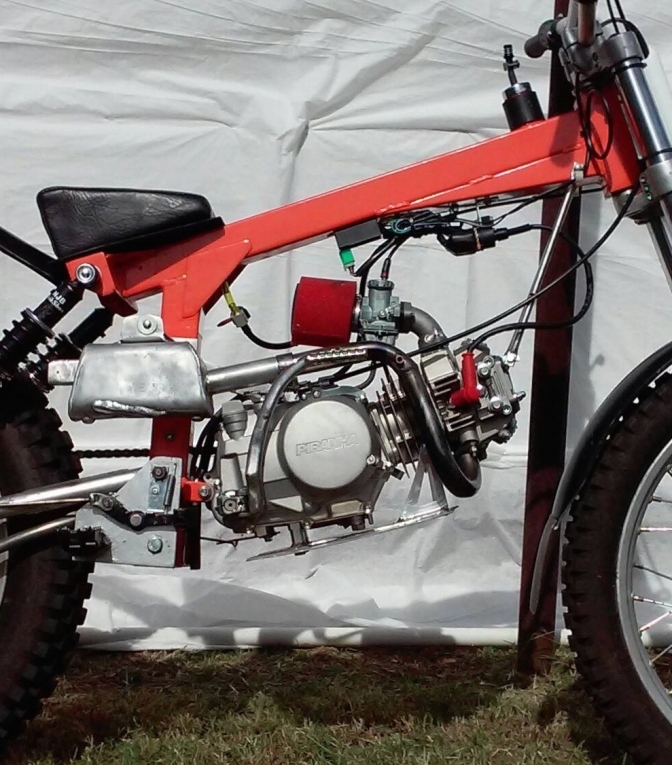 The first machine has Gas Gas forks but the second 35 mm forks because of the controversy the first machine caused. I always thought that trials riding was supposed to be a FUN sport. Big brother from Italy perhaps. More Later from Bill. and from me. 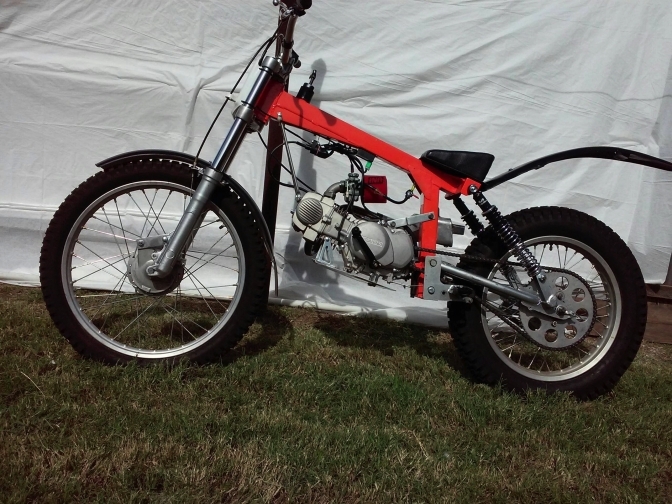 I have now decided to build one of these frames (bikes) for my spare engine to see how the concept turns out for me. So watch this space below.